The comedy trio of Banat El-Am entered the Egyptian comedy scene with a bang after making a spoof of the film The Road to Eilat. However, their latest film shows the staleness of their ideas. Though comedy is dominant in Egyptian mainstream cinema, it is rare to find films with good sarcasm. 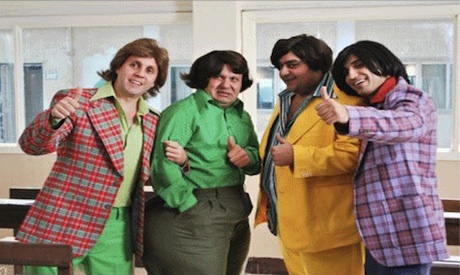 However, the comedy trio Ahmed Fahmy, Shiko and Hesham Maged, have brought out interesting work, something that can also be seen in the work of the duo Donia Samir Ghanem and Ahmed Mekky. The trio’s latest film Banat El-Am (Cousins) is not as humorous as their previous work and can even be considered a recycled version of Shahir we Samir we Bahir (Shahir and Samir and Bahir). Although the film is funny, the actors need to leave their comfort zones. Otherwise, their films will risk being copies of each other. The trio, though funny on screen, have become stale in scriptwriting. Their plots have taken a mould it seems they cannot get out of. Perhaps to maintain their success, they have to either get out of this mould or act in films they did not write themselves. In Shahir we Samir we Bahir, three brothers born on the same day from different mothers, go back in time on the day the three of them were conceived and try throughout the film to get back to the future. In Banat El-Am, three women grow up together with their grandmother in a cursed house that brings calamity to any owner that tries to sell it. When they eventually sell the house, they turn into men. Even though the themes of both these plots are common in Hollywood films, the dialogue of Shahir we Samir we Bahir stood out for being funny and offering a sarcastic perspective on the changes that Egypt underwent since the 1970s. Banat El-Am on the other hand, takes a more Hollywood mould. This can be read as symbolic of the disfigured mesh of what has become Egyptian culture, which has become highly influenced by American consumerism. It seems that many films in Egyptian mainstream cinema cannot get out of the Hollywood structure, even if the concepts and ideas are Egyptianised. In Banat El-Am the characters are plain and stereotypical of the sort that epitomise the American high school drama. Even the mad antagonist, who lives in a strange home and has an army of children working for him is somehow familiar. One can just imagine Johnny Depp taking the role. This obvious use of Hollywood motifs could be read as a knowing sarcastic approach – however it is difficult to differentiate between what is being made fun of and what is actually just pure influence from American films. Each actor has played a very similar role in Banat El-Am as in their previous film, further suggesting the trio’s need to break out of their comfort zone. The characters, despite the good acting, are flat and characterised more by their social class than anything else, a critique that can be applied to many Egyptian films and soap operas. Perhaps the Egyptian social structure, with its vast disparity between social classes sometimes impels filmmakers to choose three characters, each symbolising a social class. But here is rarely a exploration the different layers of the character. The blondish and light-eyed Hesham Maged plays the spoiled pretty girl of the rich family, with the same personality as his male character in the film, and as the mother character he played in Shahir we Samir we Bahir. Shiko and Fahmy have shown some variety, in comparison. However, they still play characters of the same social class as in their previous film; in some scenes, the similarities are palpable. Both had good performances however and successfully personified the idea of man-turned-to-woman in some very funny scenes. Currently the trio is working on a television series with a sci-fi theme. The series which will be written by them also poses the question of whether they will maintain the current structure and themes of their work or be able to renew their ideas. The series will be revealing in terms of how much this comedy trio will add to Egyptian cinema in the future.